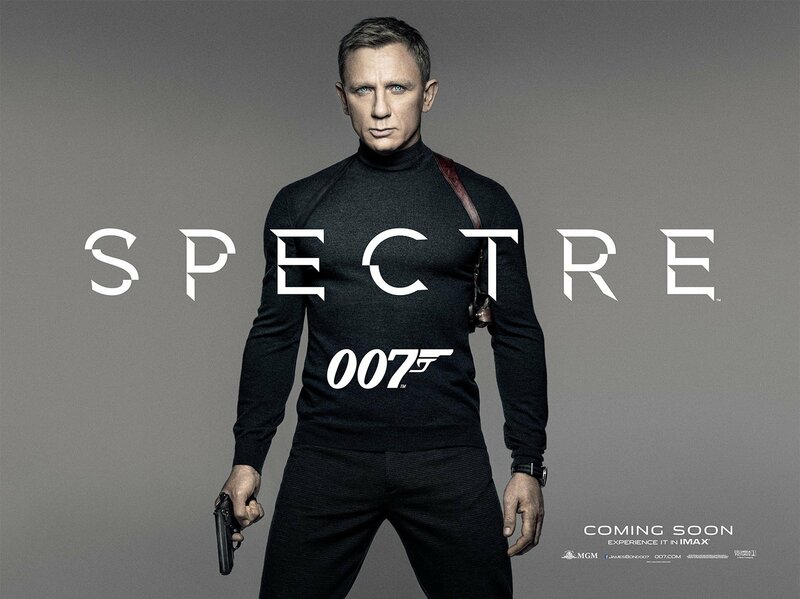 The teaser poster for Spectre was released yesterday, and it features Daniel Craig wearing a charcoal grey mock polo neck—also known as the mock turtleneck or mock roll-neck—jumper and charcoal grey checked trousers. The outfit with the visible shoulder holster immediately recalls Roger Moore’s black polo neck outfit in Live and Let Die. That outfit, in turn, was inspired by Steve McQueen’s very similar outfit in Bullitt, which was made five years before Live and Let Die. Whilst Moore’s and McQueen’s jumpers have true polo necks that are folded over, Daniel Craig’s jumper has a mock polo neck that has both ends of the collar sewn down to the neckline. It’s also shorter than a true polo neck. Daniel Craig’s jumper is also charcoal instead of black like Moore’s is, which is a more flattering choice to his light complexion. The finely-knitted wool jumper snugly hugs Daniel Craig’s body, and it has fine-ribbed cuffs and hem. It is 70% cashmere and 30% silk, and it is made by N.Peal. 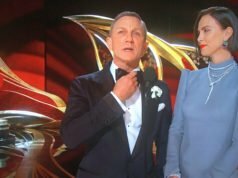 The choice to bring back the polo neck may be due to Spectre director Sam Mendes’ fond memories of seeing his first James Bond film Live and Let Die. It may also be due to the popularity of the animated spy television show Archer, in which the title character popularised the black polo neck he originally saw tactical potential in and calls it the “tactleneck”. By going with charcoal grey instead of black, James Bond makes this mock polo neck his own. Grey is actually a little better for hiding in the dark than true black is. The grey mock polo neck recalls the lighter grey one that Sean Connery wears in You Only Live Twice. The trousers are black with a tiny white or light grey tick pattern, giving them a charcoal look overall. The ends of the frogmouth pockets can be seen peaking out from under the jumper. The trousers are a blend of viscose, nylon, polyester and elastane from Neil Barrett. Very nice (and quick!) article, Matt. I just saw the poster this morning actually, in an article that also mentions Archer’s “tactleneck”. I think this is a very good look and it may catch on with the general public after the movie come out. The turtleneck looks very good on someone in great shape like Craig (or Moore for that matter). And I imagine it’s quite comfortable to wear when it’s chilly. I can’t see the edges of the frogmouth pockets but I’m sure you’re right. Does this mean frogmouth pockets are making a comeback? Just an added note, Matt: Archer actually wears turtlenecks in two colors; dark black and slightly darker black. Lol. It would make sense for frogmouth pockets to make a comeback, since formal trousers have already become more like modern jeans. But Tom Ford has done so many things in the past few years that haven’t caught on, like wide lapels and pleated trousers. I wonder if this will lead to a resurgence of mock turtlenecks? For someone my age the name brings back horrid memories of Jerry Seinfeld wearing baggy, cotton mock turtlenecks (with Dad jeans and sneakers) in such wonderful 90s colours as muted dark green…but if this look is what becomes “in” I’m all for it. Given the shape of my face and neck high turtlenecks are not flattering on me and finding lower ones has been quite the issue for many years now. The fit of the sweater is great, and I’m constantly amazed at how some costuming choices can de-emphasize Craig’s size. Which can be a good thing; it takes away from him looking like he’s all muscle or “bulky”. Actually this outfit makes him look athletic and menacing (which i assume was the intent). A+! This is an obvious homage to Roger Moore’s outfit in Live and Let Die, but I’m glad that it’s not an exact copy. Once again, Ms. Temime has shown that she is adept in dressing Bond in sportswear. Hopefully this outfit will appear in the film and was not merely selected for this poster. Also Brosnan wears turtleneck as Bond in “Die another day”. Definitely a NATO strap. Sigh. Went to an authorized Omega dealer last week who not only do not carry them, but said they are a fad. We’ll see if that holds. Omega certainly made the one Daniel Craig is wearing, and they are currently promoting them. They will probably be promoting them more around the time Spectre come out. The dealer you went to obviously doesn’t care for them and as a result doesn’t want to carry them. They should, however, be able to order one for you and put it on your watch. I just fitted a NATO strap to my Omega Seamaster. However I eschewed the ridiculous £150 the Omega Boutique in London wanted and fitted a proper UK military G10 strap instead. It certainly makes the watch more sporty, but I know I’ll be going back to the steel bracelet soon enough! Matt, Omega make the watch (it’s the Seamaster Aqua Terra, I believe) but you’re saying they also make the strap? There are many different colours of NATO watch strap available on eBay from £1.99 to around £20 depending on the seller (probably in varying degrees of quality), I’ve just ordered a £1.99 Goldfinger colour-type from China…I’ll let you know how it looks when it arrives. Re the poster: it’s nice – not as intriguing as the teaser for Skyfall (Bond in the tube/gunbarrel) but it’s a damn sight better as an image than those two final Skyfall posters (ie the ‘prom’ poster and the white background ‘lying on the floor’ nonsense), both seemingly chucked together at the eleventh hour by the kids on work experience at MGM’s publicity department. At least this one, simple as it is, looks technically competent. I hope the actual main poster isn’t another white background abortion. Do something different, MGM! This is Bond, set a trend! Dan, you can’t deny that the Skyfall poster set a trend for royal blue dinner suits! The colour was so enhanced from the actual midnight blue dinner suit in the film that people forgot what Bond wore in the film. The olive, red and black one is like the Goldfinger strap, the black and grey is the Thunderball & Spectre poster colouring. The Thunderball strap looks the same as the Goldfinger strap to me. In the better lit shots I see green and fine red stripes. You’re right. I was just going by this advert which suggested it was grey and black in Thunderball. Either way it’s interesting to see the variation on these prices. Assuming they’re ultimately the same thing (bar logos), between Omega’s £150 price tag and watchobsession’s £10, there’s quite a leap. I remain, I’m sort of proud to say, only able to afford the latter! This is where I found mine some 3 years ago for my old Submariner. Very good price to quality ratio. Had been looking for the Goldfinger pre-title sequence one for years. They don’t seem to think their “NATO/G10 YAB Strap” is the actual Bond strap. The Goldfinger strap is not a NATO G10 strap as apparently they were not introduced until 1973. It is a one piece strap with a loop in the same nylon fabric instead of the standard NATO strap we know with extra length and metal loops. There is a good view in behind the scenes stills of Connery shooting the laser sequence. Two-piece nylon strap can help approach the Goldfinger look. But Daniel Craig makes the NATO strap now “canonical” ! And I happily wore an old (navy) mock turtleneck jumper today with my Omega on a NATO strap. I also have one in black. Must get one in grey ! I have always preferred them to “full” turtlenecks. The colours of the G10 YAB on the natostraps.com are not given much credit, as is often the case with pictures on a website, or they have changed, maybe. My strap is really very close, if not identical, to the one from Golfinger. Except for the buckles, and the appropriate width. Connery’s (or whoever lent it) is to narrow. Close enough for me. Unless there is a better model available, of course. Nice, quick post, Matt! Very cool, with Bond ready for action. I too immediately thought of McQueen and Bullit. Craig looks great, if photoshopped. And the mock turtleneck is always welcome (if not that useful for me personally in Los Angeles). As for the other topics, I am underwhelmed by the poster. Despite lacklaster post 1987 main one sheets in general, the advance posters have generally been quite good. And then the main campaign for Skyfall seemed phoned in and cheap. This is very bland. I am sure we will see other similar, bland photo posters for each major character. As understand it, the NATO strap from Goldfinger (which I also understand was not really a NATO strap, but an RAF one I think) was a wink to Bond’s naval background and a nod to the Rolex Military Submariner (which Bond’s Sub was not) that was issued to some British military personnel in the 60s and 70s. This is a nice (close enough for government work) return to Bond’s screen roots, not withstanding the Seamaster placement. That said, the rubber straps on the Planet Ocean seamasters in Casino Royale and Quantum are a bit more practical and comfortable. As for being a 51 year old fad, NATO staps have been back in fashion recently especially for the L.A./West Coast hipster crowd. I don’t ever recall seeing a watch on a NATO-like strap in the last few decades but military-style fashion accessories have been in favor recently. Personally, I prefer a Rubber B for active sports. This outfit looks definitely very classic Bond. It’s interesting how some ensembles become indelibly linked with Bond. This all black (or, in this particular case, a shade lighter) look never fails to prompt “oh, very James Bond” when I wear similar. Photoshop notwithstanding, I don’t think it’s unreasonable to say that Craig is the one Bond actor who has aged the least flatteringly. This man is just 47. Pierce, Roger and even Sean at that age looked like youthful schoolboys when compared alongside Craig now. I can’t imagine how he’ll look if he continues on in the role into his mid fifties and to think of the criticism Moore got how he looked in his last couple of movies! Anyway, I read online that the shoot has moved to Mexico and later Morocco. What are the odds of a suit in some shade of brown or beige making an appearance in this climate? After all, Mendes’ favorite “Live and Let Die” featured both. While I agree that Craig has not aged well, Sean Connery aged far worse during his time as Bond, and not just in the face. Whereas Craig has stayed fit, Connery’s physician consortium steadily declined to the point where he looks terrible in DAF–at which point he was only 41! – Sorry but indeed I think it is unreasonable. Did you ever take a look at “normal” 47-aged men on the street? The majority of them certainly does not look like Craig. The man is still in excellent shape and has kept very well. What’s all this about? And please consider how the “Bond” figure is described in the novels: With a scarred face etc. After all, the character is not supposed to be neither a mannequin nor a fop. And certainly no schoolboy-milksop-like youngster who looks like coming straight out of Eton college or whatsoever. Craig is (and will remain) – together with Connery – one of the very best Bond actors ever. Matt, the Bond Experience has stated that Craig is sporting the Aqua Terra 150 M 41.5mm. Perhaps he’s using two, a la Skyfall? The watch on the poster is not the Aqua Terra. I think it’s the same Seamaster 300 that he wore on Comic Relief. He certainly could be using two, as he did in both Skyfall and Casino Royale. There’s a long tradition of Bond wearing multiple watches in his films. That’s a joke tailor made (heh heh) for people who read this blog. I have to agree with both David and Renard in that Craig looks great for the average 47 year old, but he has aged quite a bit particularly in this day and age where all Hollywood stars remain “suspiciously 35” thanks to Botox, mini-face lifts, injectable fillers, etc. Pierce himself looked a bit more fresh-faced in TWINE compared to TND and GE. Roger Moore looked great for a 53 year old in 1981, but I have friends how look at him today and think he looks ancient in FYEO. I think our concept of how movie stars age has changed a lot in the last 20 years. There were rumors that Sony executives wanted Craig to have a face lift prior to SPECTRE. Emphasis on rumors. As for Connery, he deteriorated a lot post 35, and it almost seems like he refused to get into any sort of decent shape for Diamonds. But he still looked like he could plow the north forty. If Craig continues in the role through 2018 (likely I understand, since he supposedly has one more film under his contract and every 3 years seems to be the schedule these days) he will have as long a reign as Roger Moore (12 years) but I will bet, absent surgery, he looks much worse than Roger at a comparable age (Moonraker). Craig doesn’t fit the Bond of the books at all, while with a scar on his face, was always described as darkly handsome. But I do think Craig is the best actor to play Bond. Christian, Thank you for your balanced summing up. This is a fleshed out version of precisely what I was getting at in my perfectly reasonable remark. It seems that there is a coterie of people on this blog and off it which don’t take at all kindly to anything but unreserved adulation for the current Bond! You are spot on regarding the shifting expectations towards what constitutes youthfulness on the silver screen. I still maintain that Craig, facially (I wasn’t referring to his physical shape which seems to be excellent nor did I even allude to his acting skill) looks the worst of any Bond actor of comparable age. Brosnan was a year younger than Craig in “The World is Not Enough” and Moore the same age in “The Man with the Golden Gun”. Objectively both looked far more youthful than Craig. I can’t mention Connery or Dalton as they didn’t play the character at that age. To illustrate what I mean, take Liam Neeson. He’s 63, still starring in high octane action films and looks ten years younger. He looks like a man in his early fifties. Craig looks at least 6 or 7 years older and if I were to see him and Neeson together, knowing nothing of respective ages, they’d seem as peers. This is not meant as a personal criticism of Craig but don’t forget that the producers ditched Brosnan then a fresh 49 years of age on (allegedly) the grounds of age. Although I believe there was more to it than that…. I personally don’t think being a “fine actor” is all that important to play an action hero. What is important is that the person is “entertaining” and I accept that this will be fluid and subjective. After 50 every year counts for five (see Roger Moore after “For your eyes only”). Connery had a very fast aging; in “Diamonds are forever” seemed a man of 50 years or more,in “Never said never again” a man of 60. Craigh seem ageless in this picture. Someone else said it, but… BULLITT. Clearly Steve McQueen has been a huge inspiration for Craig’s Bond. I like Archer but I promise you Steve McQueen would have been the real inspiration. Why haven’t you done a Mcqueen Craig comparison? A Craig/McQueen comparison is a good idea for an article. I made the comparison to Bullitt in this article, though I think Live and Let Die was probably the main inspiration for this outfit. Matt, while I’m not 100% sure on it, I also think the turtleneck & holster look has been seen in Bond videogames, and possibly (it’s gonna take some active research) in the ones that have used Craig’s likeness. While I’m thinking about 00-agents wearing all black commando kits, we could use more looks at the other Double-0s. How about a post on the original Thomas Crown Affair, after all Steve McQueen’s suits were made by Douglas Hayward. The NATO strap is a surprising sight, but one that makes more sense than a shiny metal strap, tactically. 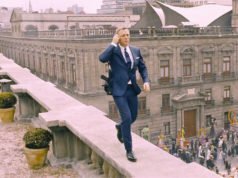 But then, Bond has always made questionable choices in tactical gear, like the expensive mock turtleneck and trousers here. Is Bond wearing some kind of silk dressing gown? Seems odd because Craig is not exactly the type for such a garment. He is wearing a dressing gown, but I can’t tell what it is made from. I see Craig in a dressing gown more than I see him in pyjamas. That’s right, and it’s possible that’s it’s borrowed from someone (perhaps a woman?). We shall see – I am looking very much forward to this.